Its that time of year again! Pretty soon my family and I will be hitting the beach every chance we can get. But even before it gets warm enough for that, we will still be spending lots of time outside at soccer games, nature walks, bike rides and more. If we're going to be outside, its important to have a good sunscreen that can protect my kids from harmful UV rays. Buts its also important that the ingredients used in that sunscreen aren't just as harmful as the sunburn I'm trying to prevent. Terra Sport Sunscreem from All Terrain is the perfect sunblock for my family. Its PABA and Paraben free and will keep my kid's skin protected. For our review, we received the Terra Sport SPF 15. There were lots of things I liked about this product, in addition to it being a more natural alternative. First of all, its not at all greasy or sticky when its applied. I also like the scent. It was very light and doesn't smell like chemicals. It almost feels like you're applying regular skin cream. It addition, its water proof and sweat resistent. So we're good at the beach and at soccer games. And of course, most importantly, it worked perfectly. There was not one speck of sunburn on me or the kids even after a full eight hours in the sun without reapplying. 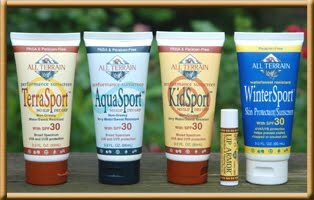 In addition to their sunblocks, All Terrain has a full line of natural products including insect repellants, santizers, bandages and even pet care items. 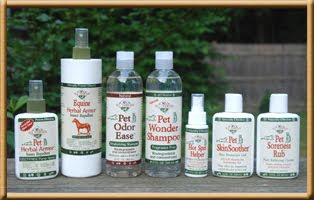 All of their products use only natural ingredients and they are cruelty free. They even sponsor environmentally oriented, outdoor events. To keep up with the latest news at All Terrain, you can follow them on twitter or become their fan on face book. You can also check out their blog. If you love the outdoors as much as I do, this is a company you'll want to keep book marked!